Well yesterday my Makey Bakey mice arrived and I sooo love them. So I have made a card for the Crafterscompanion September challenge blog which is embossing. I used Snow White centura pearlised card. 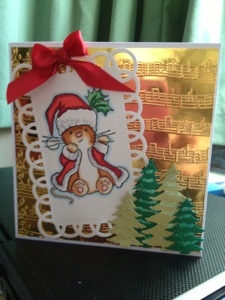 I used the seasonal notes 8x8 embossilicious embossing folder on gold mirri card. I stamped Christmas seasons Makey Bakey mice on to Neenah card stock, and coloured the image with my beloved spectrum noir pens. I used the die'sire classical frame die and finally I used the die'sire spruce trees die to cut some trees on the core'dinations card stock. And I added a red ribbon from my own stash. Lovely image and embossing, super card. This is fabulous. Love these meece and wonderful detail. Gorgeous I love the embossed background. super cute and beautiful card Sam. Such a cute image and lovely card. Absolutely gorgeous! Love the music note embossed gold background and the sweet Makey Bakey mouse. Thanks so much for playing with us at Crafter's Companion!